The official communist party newspaper, Rodong Sinmun, published a report Monday on "the EMP might of nuclear weapons," outlining an electromagnetic pulse (EMP) attack produced by detonating a nuclear warhead in space. "In general, the strong electromagnetic pulse generated from nuclear bomb explosions between 30 kilometers and 100 kilometers [18.6 miles and 62 miles] above the ground can severely impair electronic devices, electric machines, and electromagnetic grids, or destroy electric cables and safety devices," said the article authored by Kim Songwon, dean of Kim Chaek University of Technology in Pyongyang. "The discovery of the electromagnetic pulse as a source of high yield in the high-altitude nuclear explosion test process has given it recognition as an important strike method," he stated. The official discussion by North Korea of plans to conduct EMP strikes will likely fuel debate over the threat. 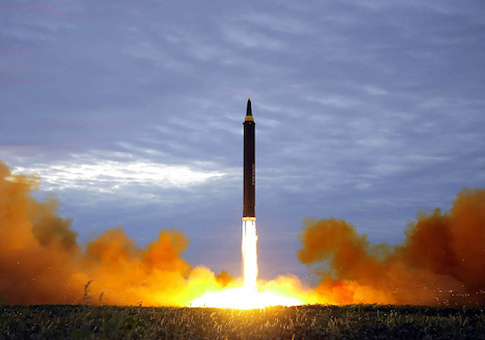 Former CIA Director James Woolsey has said North Korea is capable of orbiting an EMP nuclear weapon in a satellite. Some liberal arms control advocates have dismissed the EMP threat from Pyongyang as far-fetched, such as arms control advocate Jeffrey Lewis, who in April dismissed the threat of an EMP attack by laughing at a reporter's question. "This is the favorite nightmare scenario of a small group of very dedicated people," he told NPR. Disclosure of North Korea's intention to use its nuclear force for EMP attacks comes as U.S. intelligence agencies are continuing to analyze the latest underground nuclear test by North Korea on Sept. 3 that the regime said was its first hydrogen bomb explosion. Senior administration officials said initial assessments of the nuclear blast in northeastern North Korea indicate it was the largest test detonation so far, and much larger than an underground test carried out last year. It was the regime's sixth nuclear test. U.S. nuclear technicians have not made a definitive conclusion about the specifics of the device. Specialists are trying to determine if the test involved a hydrogen bomb, as Pyongyang asserted, or a device designed for EMP attack. They are also assessing whether the test used boosted fission technology. Hydrogen bombs are advanced devices that use a two-stage explosion process to produce a massive explosion. Boosted fission devices are less sophisticated technologically and require more nuclear fuel. "We're highly confident this was a test of an advanced nuclear device—and what we've seen so far is not inconsistent with North Korea's claims," a U.S. intelligence official said. However, a final conclusion on the type and yield of the blast is not expected for several days. Data from the test is being analyzed by nuclear weapons experts at Los Alamos National Laboratory in New Mexico. Also, the large explosion—perhaps more than 100 kilotons, or the equivalent of 100,000 tons of TN—likely produced significant venting of radioactive particles into the air. Special U.S. intelligence aircraft, including the WC-135 nuclear "sniffer" jets, are conducting flights near the test zone to gather samples of particles from the test. 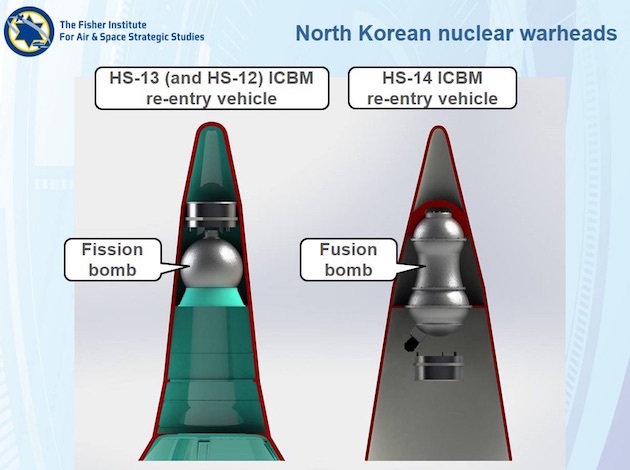 Kim, the North Korean technical university dean, stated that high-altitude explosions can be conducted in the stratosphere or in space where the blast wave is limited by the lack of air or the thinness of air. "In explosions occurring at such altitudes, large amounts of electrons are released as a result of ionization reactions of high-energy instant gamma rays and other radioactive rays," he said. "These electrons form a strong electromagnetic pulse (EMP) through interaction with the geomagnetic field." "The detonation would create a strong electric field of 100,000 volts per meter when it approaches the ground and "that is how it destroys communications facilities and electricity grids," the report said. The EMP report was published Monday, a day after the same state-run outlet reported on a visit by North Korean leader Kim Jong Un to a nuclear weapons facility that also mentioned plans for using nuclear weapons in EMP attacks. "Our hydrogen bomb—whose power as a nuclear bomb can be adjusted at will from tens of kilotons to hundreds of kilotons according to the targets of strike—is a multifunctional thermonuclear warhead which not only has enormous lethality and destructibility, but also can even carry out super-powerful EMP attack over an expansive area through detonation at high altitudes according to strategic goals," the report said. EMP was discovered by the U.S. military during above ground nuclear tests in the Pacific Ocean during the 1960s. EMP waves produced from nuclear tests were found to disrupt electronics throughout areas up to 1,000 miles from the center of the blast. Peter Pry, a former CIA analyst who has been active in urging greater defenses against EMP attack, said a congressional commission on EMP has been warning for years about the North Korean EMP threat. "EMP attack, by blacking-out the national electric grid and other life-sustaining critical infrastructures, could kill far more people than nuclear blasting a city," Pry said. According to Pry, the Congressional EMP Commission warned that nationwide blackout and subsequent disruption from an EMP strike could kill 90 percent of the U.S. population through starvation, disease, and societal chaos. "North Korea knows this, which is why state media describes their new nuclear warhead as capable of both blasting cities and EMP," he said. William R. Graham, chairman of the commission, also has warned that North Korea’s two satellites orbiting over the U.S. could be armed with EMP weapons and detonated over the United States or U.S. allies. Pry said despite the increasing danger from EMP, the commission will cease functioning Sept. 20 unless its charter is renewed. "No one at the Pentagon or DHS has asked for the EMP commission to be extended," he said, adding that the commission has produced the best expertise on the threat. The commission has urged the United States to harden the nation's electric grid and other critical infrastructure against EMP attack. But those efforts have been thwarted as the result of lobbying from the electric power industry that opposes the cost of expensive upgrades and stockpiling of transformers and other equipment. In other developments related to North Korea, U.S. officials also said there are signs North Korea is preparing to conduct another long-range missile test. Two earlier long-range missile tests demonstrated new strike capabilities. South Korean press reports said the next ICBM test could be launched over the Pacific and timed to a North Korean anniversary marking the communist state's founding on Sept. 9. President Donald Trump announced Tuesday that in response to the nuclear test the United States will sell advanced arms to both South Korea and Japan as part of its policy of seeking to pressure the Pyongyang regime into giving up its nuclear arms. "I am allowing Japan and South Korea to buy a substantially increased amount of highly sophisticated military equipment from the United States," Trump said. The president also said tougher economic sanctions are being considered. "The United States is considering, in addition to other options, stopping all trade with any country doing business with North Korea," he said Sunday. Trump also criticized China for failing to rein in its ally. "North Korea is a rogue nation which has become a great threat and embarrassment to China, which is trying to help but with little success," he said. China maintains a defense alliance with North Korea that requires defending Pyongyang from any attack. China also provides some 90 percent of North Korea's trade. The Trump administration recently imposed sanctions on Chinese and Russian entities supporting North Korea's arms programs. But the sanctions did not hit a Chinese company known to have supplied mobile missile launchers to the North Koreans for its long-range missiles. Among the options being considered are an oil embargo on North Korea that would severely cripple the country's ability to provide energy resources. Additional sanctions also could target Chinese banks that have been working covertly with North Korea. South Korea also is considering requesting that the United States return stockpiles of U.S. tactical nuclear weapons to the country. The weapons were withdrawn in the early 1990s. Another step announced by the administration is the loosening of restrictions on the payload weight of missile warheads, agreeing not to oppose Seoul's plan to build bigger warheads for its short-range missiles. 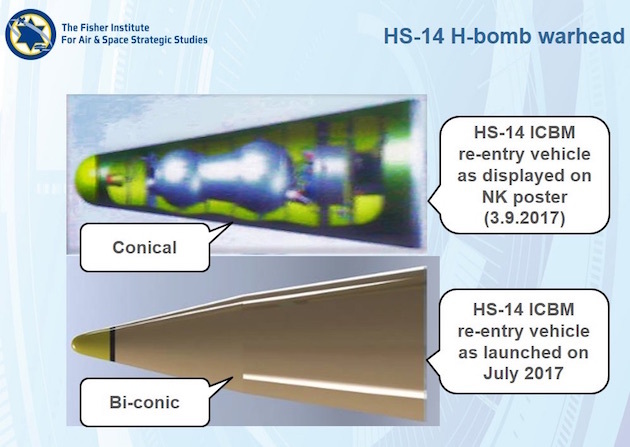 South Korea had sought U.S. approval for exceeding both the range and payload limits for missiles under informal international Missile Technology Control Regime guidelines. The MTCR limits signatories from building missiles with ranges greater than 186 miles and with warheads larger than 1,100 pounds. In Japan, Defense Minister Itsunori Onodera said Tuesday initial assessments indicate North Korea may have successfully tested a hydrogen bomb, as the regime claimed. Nuclear experts said the basis for early judgments about the nuclear test are based on seismic data. Initial estimates of the blast registered the explosion as causing a tremor ranging from 5.8 magnitude to 6.1 magnitude on the earthquake scale. Later estimates put the blast at 6.3, indicating a much larger explosion. David S. Maxwell, a North Korea expert and associate director of the Center for Security Studies at Georgetown University, said he did not think an underground test is a useful way to test an EMP bomb. "An underground or ground burst has less EMP effects but as I understand it all nuclear explosions create EMP," he said, noting that during Army training in Europe, troops took down antennas and turned off all electric devices to protect them from a Soviet nuclear strike. "It was hard back then and it will be even harder now that we are so much more dependent on electrical devices for every aspect of war fighting, and life in general," he said. Maxwell said the rapid testing of North Korean nuclear weapons and missiles is likely designed to rapidly advance its programs in anticipation of a future negotiated freeze on the programs. "I think the Kim family regime is banking on Russia and China being able to pressure the U.S. into a freeze, and the regime will agree to that if it believes it possesses a significant nuclear deterrent that it will not give up," he said.